The Joker, chief antagonist of the Batman franchise, has cycled through any number of looks during his flashy 76-year career. In the past, he has been closely associated with elegant yet flamboyant tailored purple suits. But the incarnation of the character that’s probably freshest in people’s memories right now is the muscular, tattooed, Hot Topic-loving jester played by Jared Leto in 2016’s Suicide Squad. The responsibility of creating a ”Clown Prince Of Crime” for the 21st century fell, at least in part, to artist Tina Charad, who was credited as a “costume graphic illustrator” on Suicide Squad. Recently, through her Imgur account, Charad shared some alternate, unused looks for Leto’s Joker, including makeup, wardrobe, and accessories. These pictures give fans a glimpse of the Suicide Squad that could have been but mercifully wasn’t. Oh, god, where to start here? 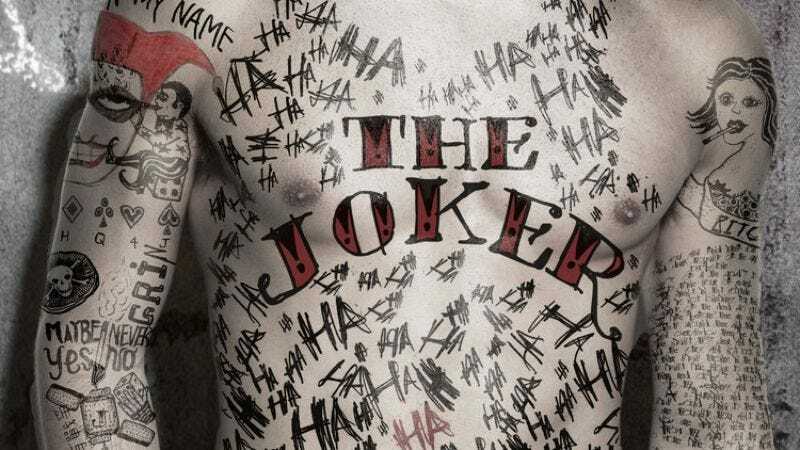 Okay, well, the Suicide Squad Joker was always going to be a “tattoo guy,” but he could have been specifically a ”neck tattoo guy,” with a dotted line, a row of teeth, and the legend “CUT HERE” all permanently inked just north of his clavicle. So the movie-going public dodged that bullet. And, yeah, he could have had a bunch of “HA HA HA”s tattooed all over his washboard abs, too. Probably best that those didn’t make the final cut. It’s a tossup as to which image is the most disheartening here. These customized purple boxing shorts maybe? “HAHA Special.” That’s cute. For any malcontents out there still griping over Suicide Squad, take comfort in the fact that things could have been slightly worse.